Expert Lookup is an online tool that helps you to identify scientific experts in just three easy steps. Find the researchers who meet your funding priorities and locate the right reviewers for papers and grant applications based on text mining of abstracts. You can also use Expert Lookup to identify potential conflicts of interest around co-authorship and funding streams. Expert Lookup can also expand your understanding of who is active in a research field. Expert Lookup uses Elsevier’s powerful Fingerprinting algorithms, Scopus's citation database of over 57 million records and 10 discipline-specific thesauri to ensure the recommended experts are relevant and definitely considered leaders in their fields. 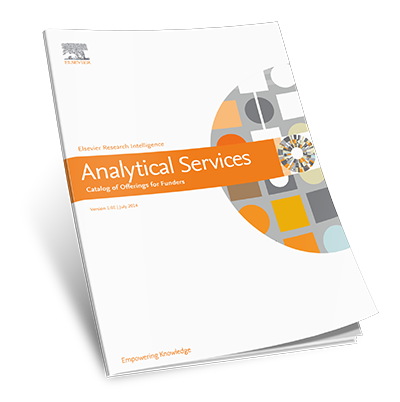 This catalogue introduces custom analytical report services for funders to measure research and funding programme performance.